In the following pages, I will add images of engines, cabooses, and other items of interest to the general “Rail Fan”. This particular caboose was used by the Southern Pacific Railroad Police for surveillance and for the protection of special trains. Union Pacific’s Locomotive No. 1943, The Spirit, was the company's 16th commemorative locomotive. The Spirit honors the United States’ armed forces and the men and women filling their ranks. Created in collaboration with Union Pacific veterans, the locomotive illustrates the railroad’s connection to the thousands of veterans who helped build America through the centuries. Southern Pacific Railroad Police car used for surveillance and other special projects. 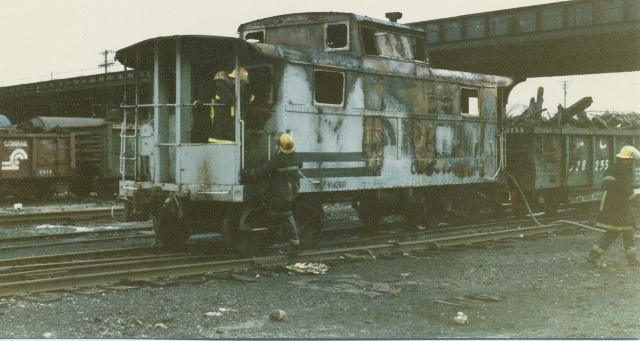 Canadian National Railroad Caboose after fire destroyed most of it. On June 20, 2010, a subject climbed onto a Union Pacific Engine in New Orleans and used a .45 caliber weapon to shoot twice through the engineer’s door window. The glass which is made to stop certain 9mm’s did a good enough job to slow the bullet down to where it only bruised the engineer. Unfortunately, this subject entered the cab of the engine and shot and killed the conductor before robbing both men. The engineer survived by playing dead. This subject was later located in Jefferson Parish and arrested after a shoot out. The MoPac’s fleet of passenger trains are well-remembered. It operated a number of popular services but is best known for its fleet of Eagles; the Aztec Eagle, Colorado Eagle, Missouri River Eagle, Valley Eagle, Louisiana Eagle, and the renowned Texas Eagle. These trains, and others, reached far and wide across its vast network. Unfortunately, most perks and comforts were removed by the 1960's as the public abandoned railroads with automobiles and airlines. The Union Pacific Railroad (UP), the largest and one of the most powerful railroads in the country, has been with us since 1862. Since it began service all of those years ago the railroad has become not only one of the most highly respected institutions in the nation but also has seen nearly every major railroading event in our country’s history, and accordingly has a very long and storied history. Its City fleet is credited as being the first lightweight streamlined passenger trains to operate in the United States. In 1934 the City of Salina, the first in the fleet, debuted as a three-car lightweight trainset that the Electro-Motive Corporation named the M-10000. The Union Pacific was so impressed with the train, and the response it received from the public, it purchased seven more sets and the City fleet was born! Following the City of Salina, also in 1934 was the City of Portland, followed by the City of Los Angeles, City of San Francisco, and City of Denver in 1936. The City fleet became revered throughout the west and rivaled the Santa Fe’s legendary Super Chief, and every other western passenger train, in exquisiteness and fine traveling. Once the trains received their Domeliners in the mid-1950s they became the lavish way to travel for many in Hollywood. The Challenger began operation in 1935 as a heavyweight train although its affordability made it so popular that soon afterward its equipment was updated (with rebuilt equipment) and featured reclining-seat coaches, diners, sleepers, and lounges. Much of the train's equipment came from discontinued runs like the Los Angeles Limited, which had since been upgraded to lightweight streamliners.